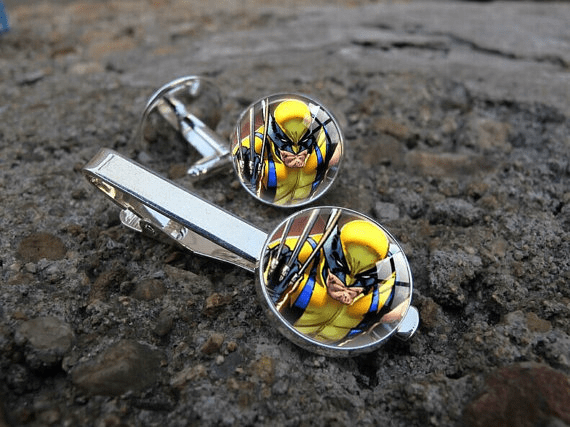 These cuff links may not be made of adamantium, but they still look pretty sharp! Classy events tend to mean boring cuff links and tie clips that just make you blend into the well dressed crowd, but these could set you apart and even be a neat little conversation starter. Not to mention people are more likely to remember you if you have something that sets you a part from the crowd! These accessories come in either brass or silver, with silver being showcased in the picture above. The actual material being used is zinc alloy and the glass decorative part is about twenty millimeters across. The seller ships these in a random gift box, so it’s ready to go as a present. Just the cuff links will cost you $9, and same for the tie if you choose to buy them separately. You get a bit of a discount if you order the link and clip set together, with the price coming to a straight $15. Shipping varies heavily, with the United States being $3, the United Kingdom, Canada, and Australia coming in at $4, and everywhere seems to have a shipping cost of $5. PROSSCOMICS is a five star rated seller on Etsy and for good reason. Look at that canvas print! It seems like a lot of what they sell involves a few artists, with this particular piece coming from Emil Cabaltierra and Omi Remalante Jr. I was able to find Omi on Twitter and Emil on Facebook. I suggest following the links provided and checking them out! Nothing like supporting an artist doing what they love. 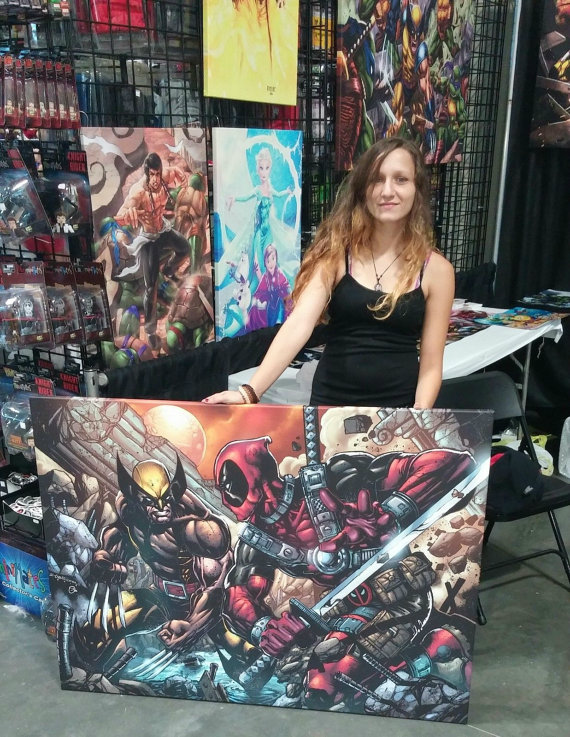 The Wolverine versus Deadpool print seen here is 48×36 inches and looks fantastic. One of the most recent reviews on their store is for this piece, and the buyer loves it! This particular artwork is $180. I know people tend to complain about the price of items like this, but a lot of work goes into these things. Shipping is a bit easier on the wallet at $5 for shipping in the U.S. and $15 to anywhere else in the world. 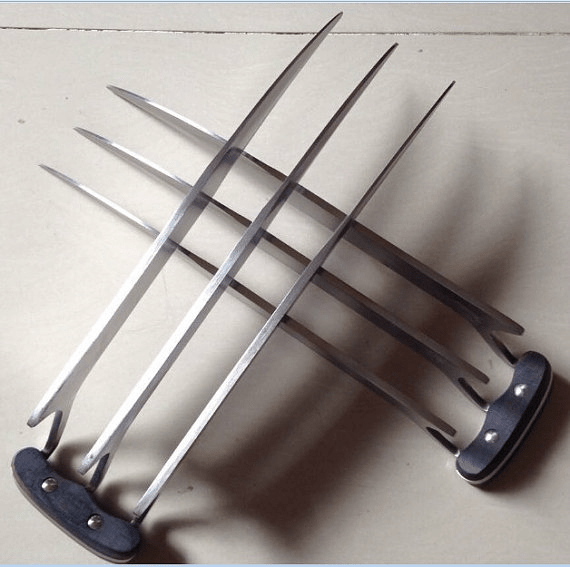 I am a little weary of this seller, but I really like the prop Wolverine claws seen here. These are stated as being made from stainless steel with a blade length of twenty-four centimeters. This is described as a metal sculpture, and it looks as though it attaches to the wall, but aside from the picture here, that’s not really mentioned in the description. I really wish the seller had posted more images of the item, preferably from behind, but they went for pictures of Hugh Jackman as Wolverine instead. An awesome looking Wolverine metal sculpture costs $75 with shipping at a flat $10 for select countries. I highly recommend asking the seller about the item before purchasing. AsBeAu seems to pride itself on upcycling items, which is just like recycling/repurposing items instead of throwing them away. Upcycling is a great way to transform an unwanted item into something that will actually be used. This tote is completely made from cotton and comic book fabric. I love items made from comic book printed fabric! 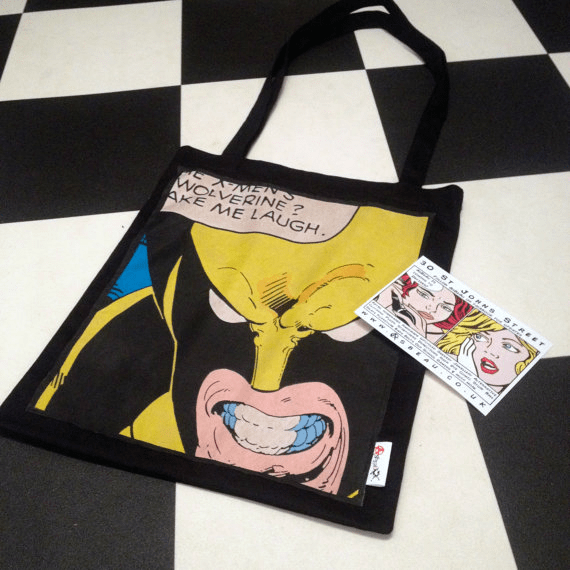 This Wolverine tote is a great idea and could be a nice gift for a friend who is really into Wolverine. The bag alone will cost you just under $20and shipping within the United Kingdom is free! <3 free shipping. If you happen to live anywhere else, prepare to shell out just over $8 for shipping. Can I just give a shout out to that store name for a second? Haha, I love it. Decorative flash drives are always awesome to come across, particularly when they tie in with your interests. The only thing you have to worry about is someone else stealing it from you or pocketing it when you inevitably forget it at the school computer area… The seller states that the flash drive is compatible with Windows XP, 7, 8, Vista, Mac OS 10+, and Linux. Basically any system you probably happen to be using. You can get these in anywhere from 8 to 64 gigabytes, with price going up as the storage space does. 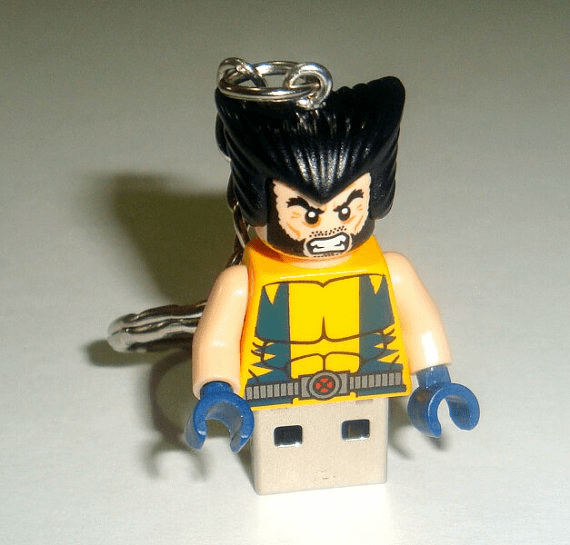 The base price of a Lego Wolverine protecting your data is $30 for 8 gigs, $35 for 16, $40 for 32, and $60 for 64. Shipping in the U.S. will run you just under $5, and shipping to anywhere else in the world is two dollars higher at just under $7. What do you think of these creative Wolverine items? Tell us in the comments!